Address: Finlandia, Puerto del Carmen (Lanzarote), Islas Canarias. La Laguneta Apartments are in a quiet residential area in Lanzarote, just 500 metres from the Puerto del Carmen beaches. There is an outdoor swimming pool and free parking. 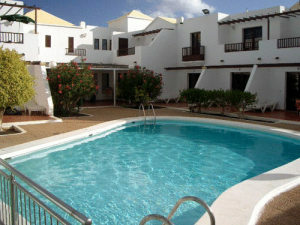 This modern complex is set in the district of Tías, just a few minutes from Lanzarote Airport. All Laguneta apartments have a private balcony. There is a living room/bedroom with satellite TV and safety deposit box. They also have a full kitchen with fridge and kettle. There is a small supermarket in the lobby. Free Wi-Fi is available in public areas. There is also a pool table. Lanzarote Golf Course is a 3-minute drive away. There is a bus stop within a 5-minute walk from the complex.